Should I attack a taunt, even if it won't kill it? In Hearthstone often I have the choice of attacking with a minion against a taunt, but it will cause a loss. The alternative, just leaving the minion on the board and doing nothing, risks losing it to AOE or a spell. Above is a typical situation. I can attack the 2-6 Stegosaur with my Phoros. 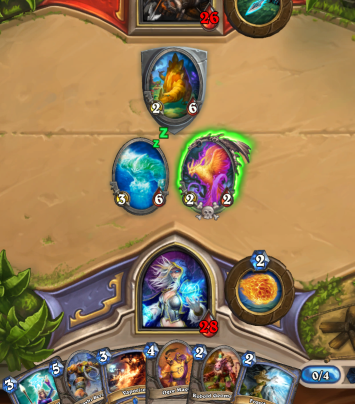 Then I might be able to kill it next turn by using the 3-6 Water Elemental and a Fire Blast. If I leave it on the board, I risk it getting killed by a multishot, but if he has no spell then it might be better to leave it. What can my opponent do the next turn? Multishot is not common but let's say he does use multishot. He just spent his entire turn killing your 2/2 and leaving you with a 3/3 against his 2/6 which can still kill his minion over two turns. He's better of just playing a Stranglethorn Tiger. What can I do the next turn? You want to get a board as strong as you can. And ideally spend all your mana. So next turn you probably want to play your Gurubashi Berzerker. This does not leave you space to fireblast his minion. Conclusion: I would leave it up. If your opponent trades into it, you have the same result as if you attacked it. If he doesn't, you can attack it with your frost elemental over two turns and leave your pyros alive. What happens when taunt is put on a stealthed minion? What types of attacks and actions *must* target an enemy with taunt? When should I start playing Arena? Why should anybody use Nat, the Darkfisher? Hearthstone strategy problem, kill with hero ability or minion, secret involved?